David Tennant's final outing as Doctor Who was watched by 10.4m viewers on New Year's Day, according to early overnight figures. 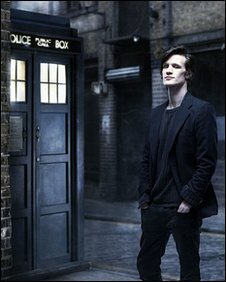 At the climax of the episode, a total of 10.8m tuned in to see the Time Lord regenerate into his 11th incarnation, 27-year-old actor Matt Smith. Tennant's final words on the show were, "I don't want to go". Smith, meanwhile, uttered the immortal line, "legs! I've got legs!" as he made his screen debut as The Doctor. The 75-minute episode ended with the Tardis in flames, plummeting towards Earth - setting up Smith's first full episode, due later this year. It was the highest-rated programme in its time-slot. ITV1's Coronation Street took second place, with 8.6m viewers. However, both had lower ratings than the day's second episode of EastEnders, which attracted an audience of 11.6m at 1945GMT. Critics were generally appreciative of Tennant's final episode, which also marked the end of head writer Russell T Davies' tenure on the show. 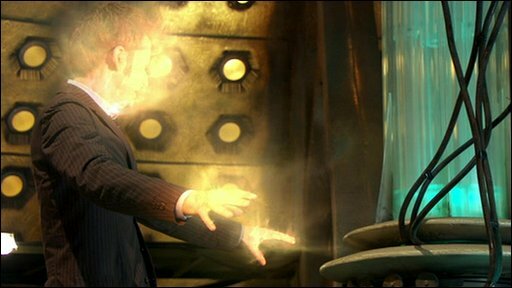 The story saw The Doctor battle against his nemesis, The Master (John Simm), who took possession of the body of every human on the planet, paving the way for the return of the Time Lords - who planned to end time itself. In The Guardian, television critic Mark Lawson likened the episode to Hamlet - a role which Tennant played with the Royal Shakespeare Company last year. "In common with the prince of Denmark, the Time Lord from Gallifrey agonised aloud over whether it would be right to kill a man (the Master) after a painful encounter with his mother, played by Claire Bloom, whose Shakespearean roles include Hamlet's mother, Gertrude," he wrote. 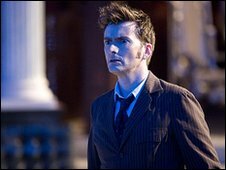 Writing on Cult TV website Den Of Geek , Simon Brew felt that, by allowing Tenant to revisit the characters he met during his four-year tenure as the Doctor, Davies had given new emotional depth to the process of regeneration. "We've never had this: 20 minutes or so for a Doctor to deal with his impending demise, with no threat to see off to get in the way. "Usually, the emotions are dealt with afterwards, as the new Doctor gets used to his new body. Here, an outgoing Doctor got to face the ramifications of what was about to happen, and it was explored exceptionally well." Meanwhile, in The Times, Caitlin Moran dissected Smith's debut . "As if to remind us of how huge the Doctor Who Universe is, and how fast it gallops on, Smith wasted no time mourning his previous, dead self. Instead, feeling his delicately featured face, he started in alarm, and shouted: 'Argh! I'm a girl!'" A preview for the new series has been made available on the official Doctor Who website. It shows Smith facing vampire-like creatures, hitting a Dalek with a mallet, and shouting what seems set to become his catchphrase: "Geronimo!" The trailer also hints at the return of Alex Kingston as River Song - an archaeologist who had appeared to have had an intimate relationship with The Doctor. Her character was created by Steven Moffat, who has taken over from Davies as the head writer of the sci-fi franchise. The new series is due on BBC One in the spring.